R.O.C.K. 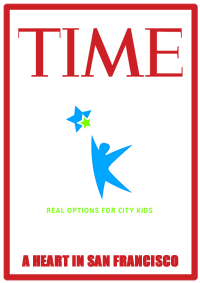 is a household name in the Bay Area that has been recognized by Time Magazine for our innovative approach to youth development. Our programs are a fine-tuned machine in which every service we provide sets our participants up for success in their adulthood. We now have a direct correlation between our many core programs such as SALT and how they lead directly to adult success due to an emphasis on leadership development. In fact, we have countless success stories such as that of R.O.C.K. Alumni Tina who recently graduated from UC Davis and started a nonprofit providing homeless youth in the Sacramento area with access to shelter, food and support. To be honest, this is not entirely true, at least not yet. It is always fun to take a step back from our day-to-day programs, and envision what R.O.C.K. can look like five years from now. I am excited to announce our partnership with Partners in Scale, a collective of talented consultants tasked with helping us plan for the next five years. Over the next few months, my team of Staff and Board members (with input from key stakeholders such as alumni, volunteers and partners) will work alongside Partners in Scale to determine how best to align R.O.C.K.’s unique strengths to meet the needs of our community Our ultimate goal is to have a clear strategy in place that ensures that our programs lead directly to our intended, long-term impact on our youth. The bottom line is that while survey results have shown we have outstanding programs in place, we recognize the need to constantly improve for the sake of our children. By creating and implementing this strategic plan, we are setting R.O.C.K. up with a sustainable future in which we are getting the most out of our resources to better serve our kids. I am excited to share our progress and the resulting plan over the next few months.